Factory MSRP: $69,388 2019 Toyota Sequoia Platinum Midnight Black Metallic Preferred Owner's Portfolio, Wheel Locks. 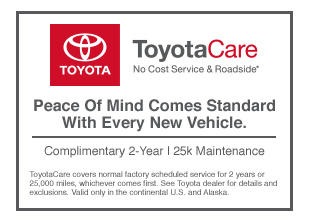 As part of the Toyota family, your exceptional ownership experience starts with ToyotaCare, a no cost maintenance plan with 24-hour roadside assistance.The ToyotaCare plan covers normal factory scheduled service for two years or 25,000 miles, whichever comes first. 24-hour roadside assistance is also included for two years, regardless of mileage.